So I've been really enjoying wearing my new Trollbeads bangle. Bangle and bracelet set featuring Rocky Beach Kit, Redbalifrog (RBF) beads and a variety of "stones"
If you follow Curling Stones on Twitter or Facebook then you may have noticed the sneak preview of the full bracelet and bangle set I made earlier this week... I previewed the following surprise on there too. So having gone from no bangle, because it makes me feel sick to still feel slightly sick but with a bangle to yay double stacked bangles!! So what happened? Another tax refund? Surprise present? Mugged a fellow trollie? No, it was a case of right place, right time again. 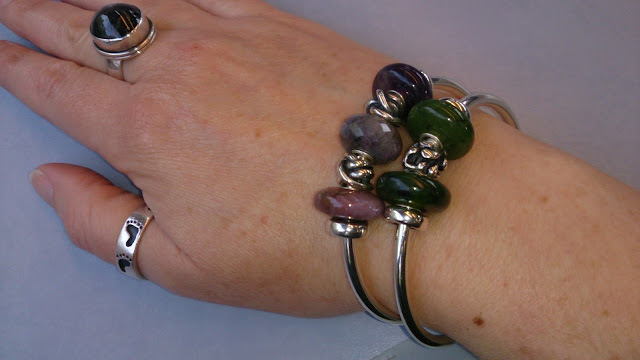 Having previously returned a gorgeously deep purple faceted amethyst (fab colour but one too many inclusions) and having sold an artisan safety chain - my PayPal account was looking quite healthy, so coupled with an XS Aurora Bangle Set with the Aurora bead missing and it was bargains all round! A few days ago I said that the only thing stopping me from buying a 2nd bangle was the price... obstacle overcome! 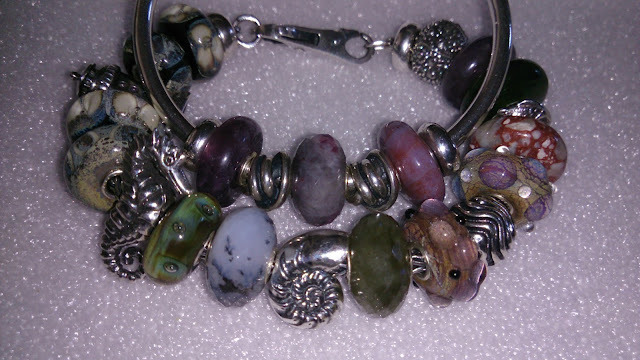 The back of both my bangles, see the difference? 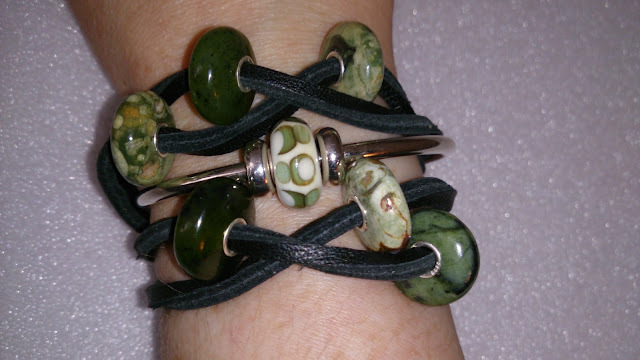 The second XS bangle has a slightly larger opening! So my on and off dilemma on this one really isn't a dilemma, those extra couple of millimeters really make a big difference. 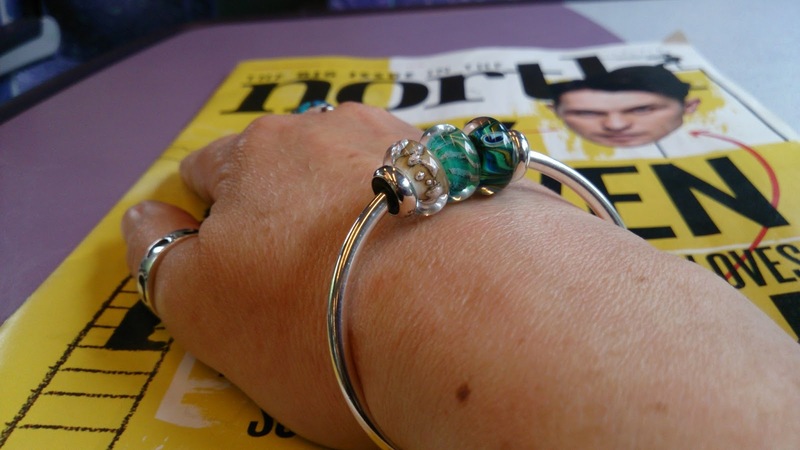 I'm so pleased to have found a second bangle at such a great price, and even more delighted to have one with a slightly bigger opening. 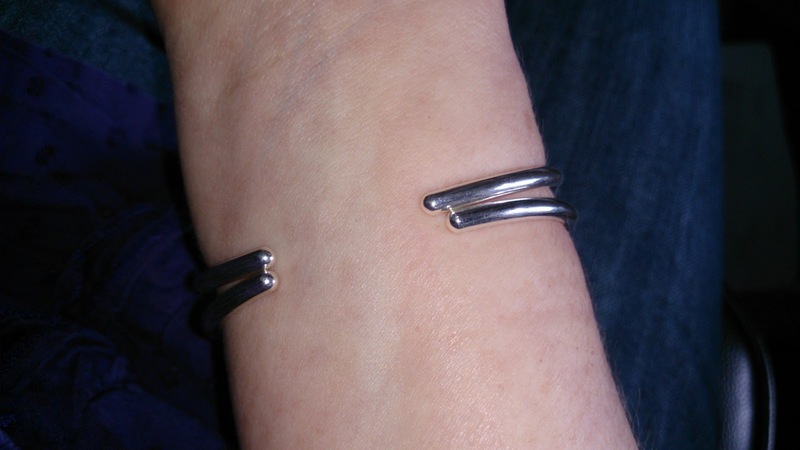 So for anyone afflicted similarly, I guess bangles really are worth trying on/comparing in person. I have no idea whether this is typical or a one off, but if anyone else has experience of "same size but different opening" I'd be really interested in your comments.